Families today are busier than ever. With job demands, soccer practice, homework, birthday parties and all of the other activities competing for our time and attention, it can sometimes seem like we have no time for daily things, like cooking and eating together as a family. This is a pity because often times these everyday things can have a long-term impact on family togetherness. Research shows that there are many benefits to cooking and eating dinner as a family each week. In addition to being a fun way to start your week and spend quality time together, evidence also links family dinners to healthier life choices. When children are involved in preparing the food, they are much more likely to eat what they make. For example, Columbia University’s National Center on Addiction and Substance Abuse suggests that children who eat family dinners get better grades in school, develop communication skills and are less likely to try drugs. The American Academy of Pediatrics found that children who ate dinner with their family regularly were less likely to be obese. Cooking also reinforces skills to help children succeed in math, teamwork and following instructions. With these benefits, it’s worth setting aside Monday in your schedule to cook and eat together as a family. Why Monday? A growing amount of research suggests that healthy thinking and behavior are in sync with the seven-day week and the meaning we associate with the days of the week, with Monday being the day people are most “open to buy” health. There’s a surge in healthy contemplations and actions on Monday. Engaging in healthy behaviors on Monday helps people sustain healthy behavior throughout the week. The Kids Cook Monday initiative encourages families to set aside the first night of every week for cooking and eating together as a family. When children pitch in making meals, they’re empowered to consider the portions, the vitamins and the nutrients of what they’re eating. And since the family that cooks together eats together, parents can check in with their children during dinner. A student at one of the recent events mentioned that he usually “hates” tomatoes, but that in the Rainbow Pasta recipe he had just prepared, he “loved” the tomatoes. Diana Rice, RD, who led the event at P.S. 32 mentioned that not only are “home cooked meals often more nutritious” but that “when children are involved in preparing the food, they are much more likely to eat what they make,” as was evident with this particular student. 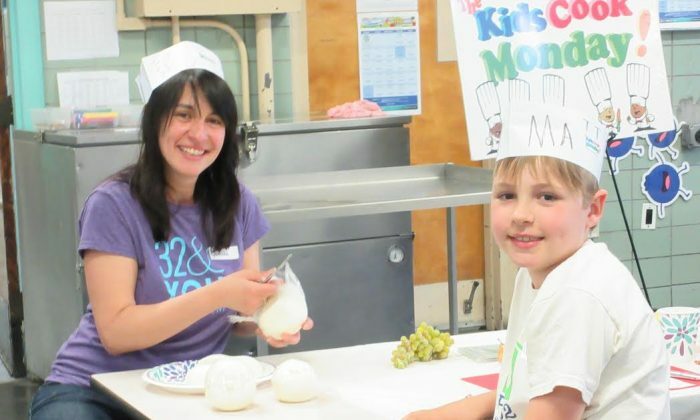 The Kids Cook Monday partners with The National PTA and FoodCorps. 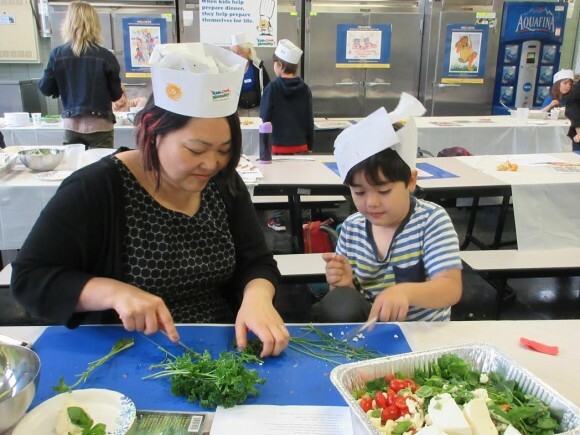 Local PTA wellness committees and FoodCorps service members host free Family Cooking Night events, like the one at P.S. 32, throughout the country. Come up with a few dinner staples. Figure out how to make healthy versions of your family’s favorite dishes, and choose a few to make your dinner go-tos. If your family likes pizza, try topping pizza with some veggies. Burritos with beans, veggies and guacamole are another great option. Shop together each week. Keep your children busy – looking at labels and talking about which item is the better, more nutritious choice. You can make it into a game – for example, allow your children to choose whichever item they want, as long as sugar or corn syrup is not the first ingredient listed. Give your children jobs, from supermarket shopping to clean-up. Once you are ready to cook, assign your children roles in the kitchen preparing dinner (chopping, mixing, measuring), setting the table, and clean-up (clearing the table, rinsing dishes, throwing out trash). Involve them in preparing the meal – from shopping in the supermarket to the clean-up. For more information, family friend recipe ideas and free downloads, check out TheKidsCookMonday.org. The Kids Cook Monday also offers a toolkit for families who want to get their kids cooking here. Nara Sandberg is the Partnerships Coordinator at The Monday Campaigns. For The Kids Cook Monday, she works with individuals, schools and organizations in providing free program resources. The Kids Cook Monday is a project of The Monday Campaigns. The Monday Campaigns is in association with the Columbia Mailman School of Public Health, the Johns Hopkins Bloomberg School of Public Health and the Syracuse Newhouse School of Public Communications.